ONE PROGRAM. ONE FACULTY. THREE CAMPUSES. Whether Chicago, London, or Hong Kong, students are taught using the Chicago Approach, an educational philosophy rooted in the belief that great ideas start with rigorous inquiry. Students evaluate problems and opportunities through fundamental disciplines that underlie how organizations function, how markets work, and how people make decisions. Using this diverse array of analytical and behavioral tools, students learn how solid analysis and good data foster new ideas and contribute to solving the world’s largest problems. The school’s intellectual culture of rigorous inquiry not only defines Chicago Booth, but also shapes student life. MBA students join a global group of executives who share a passion and curiosity for exploration—going beyond their comfort zone and emerging on the other side stronger, more self-aware, and self-assured. The Executive MBA Program admits a class of about 90 experienced professionals every summer at each of the three campuses. They come from diverse industries and backgrounds, with an average of 13 years work experience. There are ample opportunities during the program to take classes and network with students from each campus. One of the top-rated career services departments of any business school in the world supports the school’s MBA students and alumni. With offices in Chicago, London, and Hong Kong, Chicago Booth’s Career Services team is dedicated to fostering career development and creating opportunities by building relationships with employers. Whether students and alumni are changing careers, advancing in an existing field, or fostering entrepreneurial aspirations, Career Services will work closely with them to refine their goals and help them successfully navigate the career development process. The general management curriculum is designed to refresh, expand, and strengthen the grounding of students in the fundamental disciplines of business so that they are better equipped on the job and in the future. Students gain the business tools and analytical thinking to put everything together - the economics of human resources, the financial business case, writing skills, brand strategy, and negotiation techniques. During the 21-month program, students take 17 courses together with their colleagues in a pre-selected format. Each student then selects between three to five electives to complete the course of study. In addition to the management, foundations, functions, and business environment courses, students also can specialize in one of six focused areas of study: capital markets, corporate finance, entrepreneurship, marketing, strategy, or leadership and management. The program ends with a capstone simulation course. The course provides the opportunity to integrate concepts and tools from much of the curriculum in a complex, multi-round simulation game that culminates in a presentation to a panel of judges. 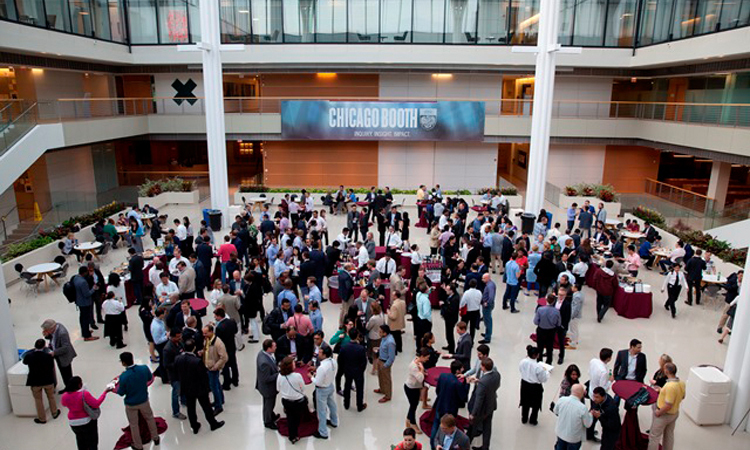 A required course across all Chicago Booth MBA programs, the LEAD (Leadership Exploration and Development) program was one of the first experiential leadership development programs at a major business school. The school continuously updates it to adapt to the evolving challenges of leadership. Within the Executive MBA program, LEAD sessions occur over a number of quarters throughout the 21-month program. LEAD helps enhance students’ self-awareness and interpersonal effectiveness by providing them with an opportunity to benchmark themselves with respect to critical aspects of leadership – teamwork, influence, conflict management, interpersonal communication, and presentation skills. As such, the course challenges students to explore who they are as leaders and to create a personalized plan that guides their continued development at Booth and beyond. Students work on desired leadership traits in alignment with personal leadership aspirations and professional direction.